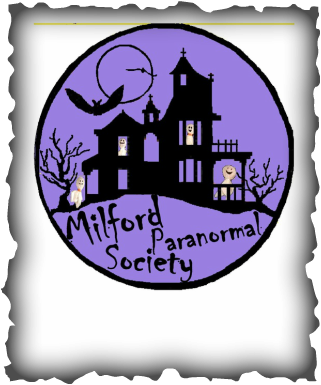 In 2005, Francine and Steve Haydon, along with the owners of Enchanted Moments, Robin Stapp and Monica Vance, formed the Milford Paranormal Society (better known as the MPS) to investigate possible paranormal activities in the businesses and homes of the Historic Milford area. Francine and Steve Haydon are Certified Ghost Hunters and native Cincinnatians who now live in the greater Milford area. We became members of Ghost Chasers International in 2002. We, along with Monica and Robin, use our psychic abilities and scientific equipment to do paranormal investigations and clearings of businesses and personal properties. Our numerous investigations, which started in 2005 and are on-going, resulted in the formation of the highly successful “Ghost Walks of Historic Milford”. We have investigated Enchanted Moments store and studio, Row House Gallery, the site of the current Gun and Military Supplies store, Early’s Antiques, Gayle’s Antiques, Park National Bank and the Masonic Lodge and other local establishments. The Ghost Walks combine historical information of the area with the results of our various paranormal investigations of the buildings. The Ghost Walks of Historic Milford are held every Friday evening in October and begin at 8:30 PM at Enchanted Moments, 127 Main Street, Milford, Ohio 45150. Participants can call Enchanted Moments at 513.831.5508 to make a reservation. Private Ghost Walks are also available for groups of 15 or more on different times and dates. Over the years, Ghost Walk attendees and customers of Enchanted Moments have asked about joining our group to help do the investigations. Now you can! First year membership costs $35 and you will get a MPS tee-shirt and a membership card. Annual renewal memberships will be $20. Members will be invited to join us on our investigations. However, since it is not advisable to take large numbers on each and every ghost investigation, members at large will be chosen by lottery to assist with each particular investigation. In fact, we are working with a local historical establishment to do an exclusive, first time ever investigation of the property this fall on Sunday, October 27th. More information will be announced when all the details are confirmed. Francine and Steve Haydon also offer a “Ghost Hunting 101” class at Enchanted Moments for all interested ghost hunters.